The Intel BOXNUC8I5BEK NUC Barebone Kit (BOXNUC8I5BEK) enables system builders and enthusiasts to assemble and configure a small form factor PC that rivals the speed and power of conventional desktop PCs. Equipped with an 8th generation Intel Core i5 processor with integrated 4k-capable GPU, an M.2 SSD slot, two DDR4-SODIMM memory channels, a total of four USB 3.1 ports, a Thunderbolt 3 port, Bluetooth 5.0 support, wired and wireless LAN connectivity, and a headphone/microphone jack, the Intel Bean Canyon NUC is ready to be equipped with premium components that will make it a compact, high-end mini-PC. The Intel Core i5-8259U processor features four high-performance cores that can handle eight simultaneous threads at a base frequency of 2.4GHz and a maximum boost frequency 3.80GHz. It comes with support for Intel Optane Memory, Intel Hyper-Threading, and Thermal Monitoring technologies that boost responsiveness and speeds up application load times. Intel Iris Plus Graphics 655 lets you watch 4K videos and view HD images without any issues. It comes with support for DirectX 12 and OpenGL 4.5 for rendering high-quality graphics. 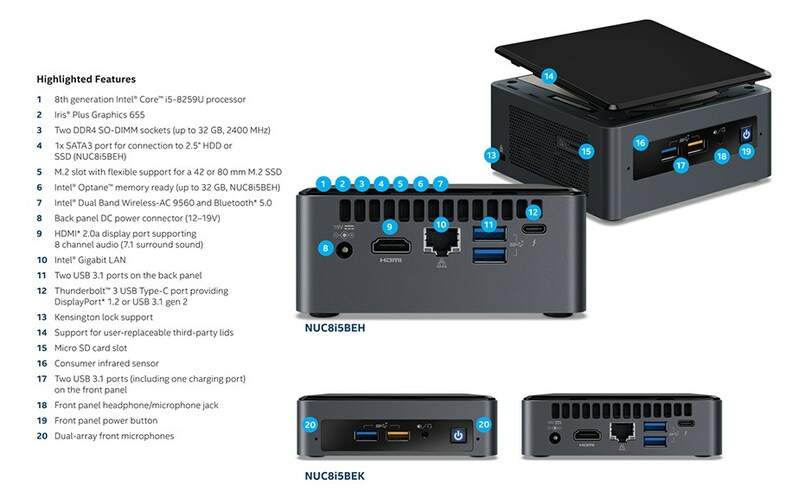 The Intel NUC Barebone Kit with Intel Core i5-8259U processor is the best choice for building a mini-PC that matches the performance of mid-tier workstations but does not take up a lot of desk space.